How much more water does it take to produce an ounce of bread, than a ounce of juice? The answer is not quite what you might expect. 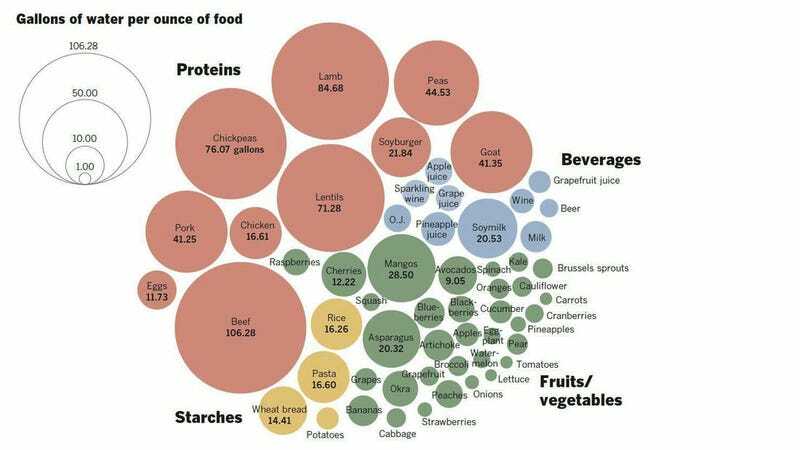 This chart is the work of Kyle Kim over at the LA Times, and it breaks down just how much water goes into producing different kinds of common foods. As you can see, meat is (unsurprisingly) the top water siphoner, but even beyond that category there are some pretty thirsty foods, like bread, asparagus, and mangoes. Of course, while the ounce-to-ounce comparison is a good way to see relative usages, it's not a perfect one-to-one comparison in terms of serving sizes. Spotting a 16-ounce steak on a menu is hardly uncommon. Knocking back 16-ounces of grapefruit juice in one go, however, seems a little excessive. Still, it's a good reminder — particularly as the droughts in large-scale agricultural production areas, like California, get deeper — that our food supply depends on our water supply. Some of it more than others.